Nettie Hinshaw1 [Nellie Henshaw2, Jenet Hinshaw3, Jeanette Henshaw1]. Eunice Robinson, born Aug 1888, North Carolina. Hubert/Herbert Robinson, born Apr 1892, North Carolina. Grace Robinson, born Mar 1896, North Carolina. Blanche Robinson, born Sep 1899, North Carolina. Robertson, Robert, head-of-household, age 45, born Mar 1855 in North Carolina; parents born in North Carolina; married 17 years; occupation: carpenter; owned home (free). Robertson, Nettie, wife, age 37, born Aug 1866 in North Carolina; parents born in North Carolina; married 17 years; 7 children, 7 living. 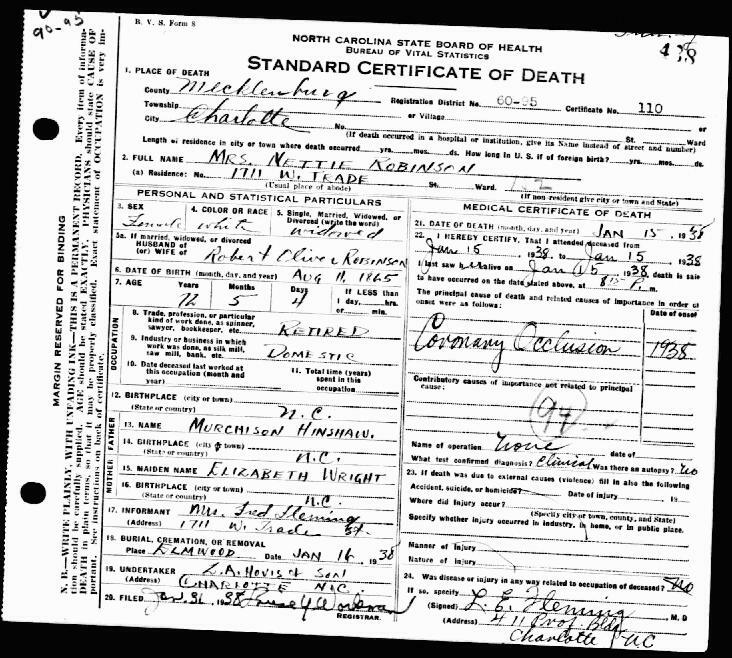 Robertson, Florence, daughter, age 15, born Feb 1885 in North Carolina; parents born in North Carolina; attended school 3 months. Robertson, Eunice, daughter, age 12, born Aug 1888 in North Carolina; parents born in North Carolina; attended school 9 months. Robertson, Etha, daughter, age 10, born Nov 1890 in North Carolina; parents born in North Carolina; attended school 9 months. 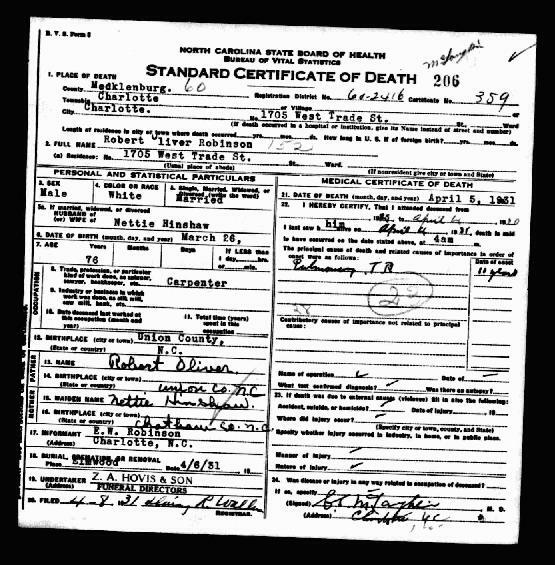 Robertson, Herbert, son, age 8, born April 1892 in North Carolina; parents born in North Carolina; attended school 9 months. Robertson, Edga, son, age 6, born April 1894 in North Carolina; parents born in North Carolina. Robertson, Grace, daughter, age 4, born Mar 1896 in North Carolina; parents born in North Carolina. Robertson, Blanche, daughter, age 8 months, born Sept 1899 in North Carolina; parents born in North Carolina. Robinson, Robert, head-of-household, age 55, born in North Carolina; parents born in North Carolina; first marriage, married 26 years; occupation: carpenter, contractor; owned home (free). Robinson, Nettie, wife, age 44, born in North Carolina; parents born in North Carolina; first marriage, married 26 years; 8 children, 7 living. Robinson, Herbert, son, age 18, born in North Carolina; parents born in North Carolina; occupation: launderer, laundry. Robinson, Edgar, son, age 16, born in North Carolina; parents born in North Carolina; attended school. Robinson, Grace, daughter, age 14, born in North Carolina; parents born in North Carolina; attended school. Robinson, Blanche, daughter, age 11, born in North Carolina; parents born in North Carolina; attended school. Robbinson, Robert O, head-of-household, age 64, born in North Carolina; parents born in North Carolina; owned home (free); occupation: carpenter, house. Robbinson, Nettie, wife, age 54, born in North Carolina; parents born in North Carolina. Robbinson, Blanche O, daughter, age 21, born in North Carolina; parents born in North Carolina. Jones, Eugene, boarder, age 26, born in North Carolina; parents born in North Carolina; occupation: foreman, guanno factory. 1880 census, Charlotte, Mecklenburg County, North Carolina; roll T9-0971, ED 105, page 275B, line #45, family #56. 1870 census, Graham P.O., Graham Township, Alamance County, North Carolina; roll M593-1121, page 60, line #6, dwelling #107, family #116. 1910 census, 10th Ward, Charlotte, Mecklenburg County, North Carolina; roll T624-1122, ED 114, page 10B, line #77, dwelling #249, family #213. 1920 census, 10th Ward, Charlotte, Mecklenburg County, North Carolina; roll T625-1310, ED 156, page 2B, line #62, dwelling #28, family #30. 1900 census, Charlotte Township, Mecklenburg County, North Carolina; roll T623-1205, ED 42, page 17A, line #26, dwelling #304, family #326. 1900 census, Charlotte Township, Mecklenburg County, North Carolina; roll T623-1205, ED 42, page 17A, line #19, dwelling #303, family #325. 1910 census, 10th Ward, Charlotte, Mecklenburg County, North Carolina; roll T624-1122, ED 114, page 10B, line #83, dwelling #250, family #214. 1920 census, 10th Ward, Charlotte, Mecklenburg County, North Carolina; roll T625-1310, ED 156, page 2B, line #55, dwelling #27, family #28. 1920 census, 10th Ward, Charlotte, Mecklenburg County, North Carolina; roll T625-1310, ED 156, page 2B, line #71, dwelling #30, family #32.